As bilingual education becomes a focus of our local schools, the Parent/Child Center is changing the previous drop-in center model to early childhood dual language mornings. We’re excited to offer two classrooms with bilingual teachers and brand new materials and furniture. The program is open to families with children from birth to age 4. 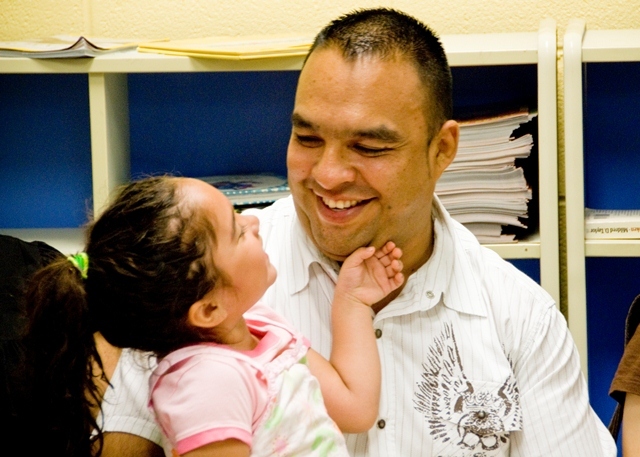 Parents or caregivers remain onsite while children play under the care of nurturing, experienced staff. Monthly themes in Spanish and English are woven into the morning classes using play, music, and movement. Research has shown that learning two languages during the early childhood years contributes to future academic success. In addition, two of the seven North Shore School District 112 kindergarten through fifth grade schools are “dual language academies.” Our dual language mornings will set the children attending on a great path to school readiness if parents choose one of the local dual language schools. Please note: Dual language mornings will not be operating with the previous drop-in center model. Classes will be offered in once or twice a week in scheduled sessions. Registration for the fall session is ongoing. Please see below for details. In 1983, the Parent/Child Center was founded by local early childhood professionals to provide a warm, welcoming place where families connected with others in the same stage of life. This program is based on the idea that providing support and education at this early stage of family life helps to build a secure foundation for the future. Parent/Child Center classes are organized by child’s age and parent’s involvement. Each class’s activities are specific for the child’s appropriate stage of development. If you have questions for which room you and your child would fit best in please contact our staff upon registration. You and your infant can play and interact with others in a comfortable, relaxed, and safe environment either by joining the toddlers in the Rainbow Room, or by playing on the gym stage. An experience staff member, trained to provide information and resources, is always available to facilitate play time and to offer support to the adult in attendance. Opportunity for a gradual separation experience when you and your child are ready. Before attending please familiarize yourself with our Rainbow Room Guidelines. Please view our suggested Guidelines for Separation for helpful tips. Before attending please familiarize yourself with our Sunshine Room Guidelines. These guidelines were developed by our staff in order to provide a safe, healthy, and positive experience for families who attend the Parent/Child Center. If you have any questions or concerns about the guidelines please contact Bobbie Hinden, Center Director. Thank you for helping us make our center a safe and enjoyable space for all to enjoy! Our center is in the lower level of the Highland Park Presbyterian Church located at 330 Laurel Ave, Highland Park, 60035. The center has two well-equipped children’s playrooms, a comfortable room known as the “Parent Lounge,” a large gym, a bathroom, and an office. The church and Family Focus spaces are accessible to persons with disabilities via a ramp to the left of the front entrance to the church, and an elevator. Parking is available in the parking lot across the street from the church at the northwest corner of Laurel Avenue and Linden Avenue. Parking is allowed in 3 rows in the parking lot– the west side near Linden Avenue is reserved for permitted parking only. If you have several young children or other extenuating circumstances it is legal to park on the south side of Laurel Avenue east of handicapped spaces in front of the church. However, at the request of our neighbors, please use the parking lot whenever possible. Strollers may be parked in the upstairs side hallway on the right side of the church before you take the stairs down to Family Focus. If you wish to use the elevator you may bring your stroller and park it downstairs in the Family Focus hallway. Miriam Vergara, Group Facilitator, joined the Sunshine Room team in September 2015 as a bilingual teacher and is also on the staff at ASAP (After School Activity Program) at Oak Terrace School. Miriam is excited to take on the new challenge of Group Facilitator. She will work with the dual language staff to plan the dual language mornings. She is a graduate of Lake Forest College, and brings her knowledge of the Latino community as well as her creative talents in art and dance to our programs. Marilu Betancourt from the Rainbow Room has been a teacher at the Thursday dual language program since 2007 and will now supervise for both days of the dual language program. She acts as a liaison to the Spanish speaking families who attend the program, and has also been on the staff of Family Focus’ Right from the Start program since 2004. Marilu has an associate degree in Tourism from her native country of Mexico. Cathleen Hamili first came to the center as a parent but has been a facilitator of the Baby and Me program since 2002. She is now co-teacher of the Sunshine Room with Mariam and is also an ASAP teacher at Indian Trail. Cathleen has a master’s degree in Human Services from Loyola University and has had experience in counseling young women. She has been involved with the dual language morning program since it’s beginning. Jennifer Siegal from the Rainbow Room joined the Parent/Child Center staff in September 2017 after attending the drop-in program with her daughter. She has a B.S. degree in Special Education from Northern Illinois University and has experience working with children with special needs as well as preschoolers. She lives in Highwood with her husband and two children.